How to get there: The West coast of Norway is pretty difficult driving due to all the mountains and fjords. The best route from Bergen is about 225 kilometer and one ferry. Drive via Gjermundshavn, take the ferry across the Hardangerfjord, continue through the Folgefonna tunnel to Odda (toll NOK 60 in 2004). 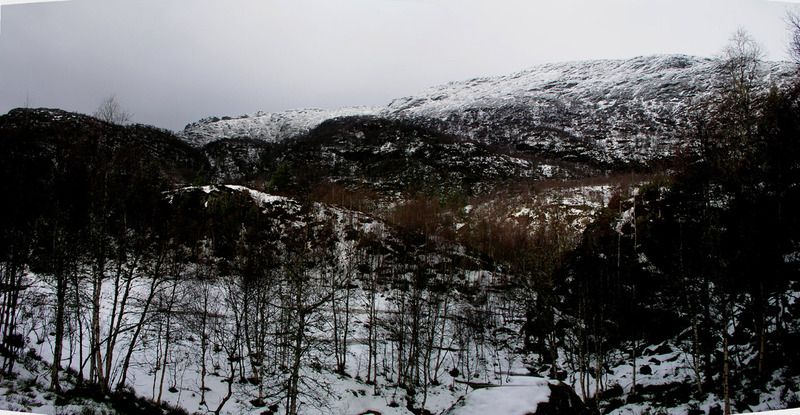 From Odda, continue to Røldal, then make a sharp right towards Suldal on Hwy. 13. This road has spectacular scenery, lakes, mountain cliffs going straight into the lakes, you must drive it to comprehend it. After 50.8 kilometer along Hwy. 13, as measured from the intersection in Røldal, you are in Suldal. Turn right just before the white church, then make an immediate left just after the church. This little road takes you between the church and the "Suldal Bedehus". Drive this road a short distance to its end where there is a nice parking area. This is the trailhead. Note that this road is quite new and NOT marked on the M711 map. The trailhead is 92 meter above sea and has coordinates N59:29:650, E006:29:039. An alternative route from Bergen, the latter part of which will also serve people coming from Stavanger, starts out on the main Hwy. E-39 that connects Bergen to Stavanger. About 35 minutes south of Bergen there is a one hour ferry to the island of Stord. From here, drive south along E-39, crossing bridges and a tunnel (toll crossing) until the intersection with E-134. Go 18 km north-east along E-134, then right along Hwy. 46 via Vats to Sandeid and further to Ropeid (means a short crossing where one could call across for a boat), then with ferry across to the small village of Sand. Continue about 15 km from Sand along Hwy. 13, to Suldal and locate the white church on your left hand side. Route description: From the trailhead, follow the path that continues gently uphill. This path bends left and after a while, there is a small wooden sign that points right with the name Prestastølen. Take this trail and head steeply uphill. The trail is marked with small hanging pieces of wood, they are painted red at both ends with white color in the middle section. After a steep climb, the trail levels off and then climbs more gently on the right side of a small lake. 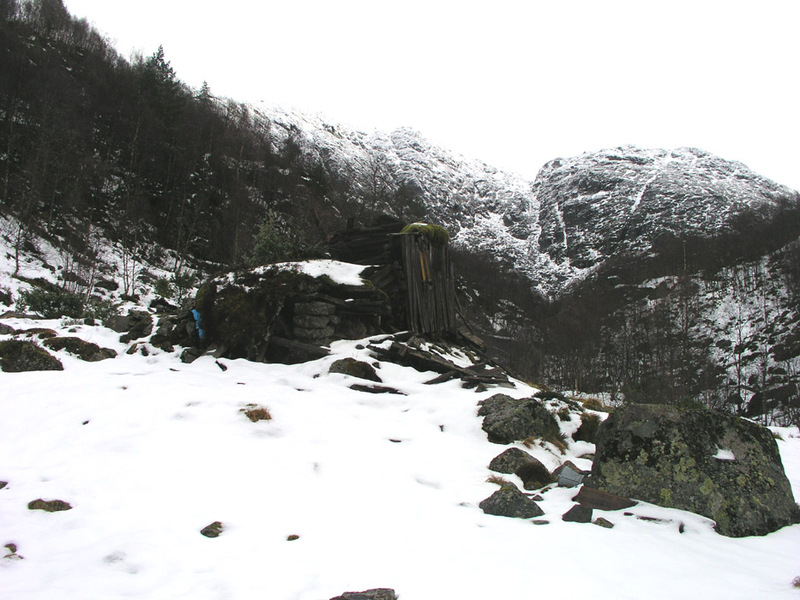 The trail eventually descends a little into a flat area that is called Breidastølen or Prestastølen. Cross a small creek, the ruins of the old cabin is to your right. Straight ahead there is a sign stating both Breidastølen and Prestastølen. An arrow pointing left directs you to the upper farm cabin as well as to Vinjanuten. Note that all signs and arrows say Prestastølen, whereas the M711 map has named this place Breidastølen. The trail quickly ascends a distinct hill, then levels off in order to reach the cabin, this one being much better maintained than the ruin below. This cabin is at coordinates N59:30:748, E006:27:857, elevation 731 meter. Two creeks are coming down to this area, having a small mountain right ahead in between them. 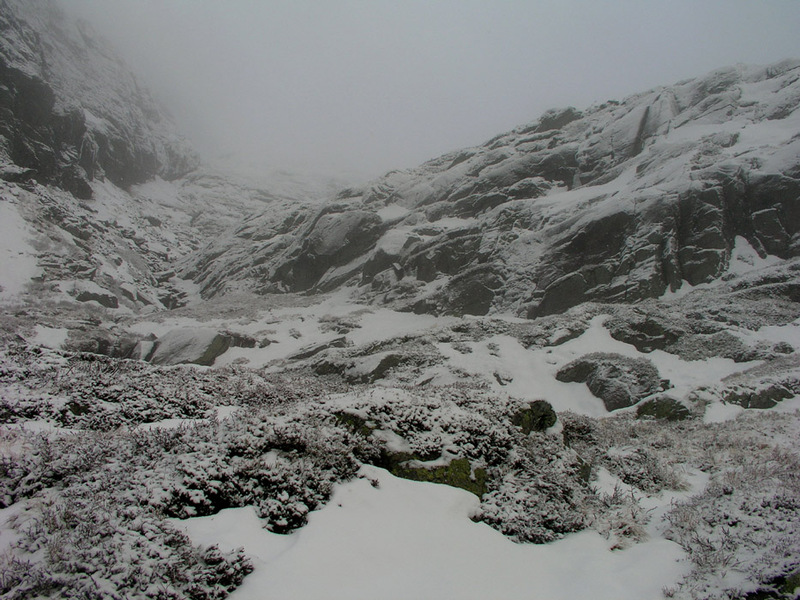 The route to the summit initially runs on the right hand side of the rightmost creek. 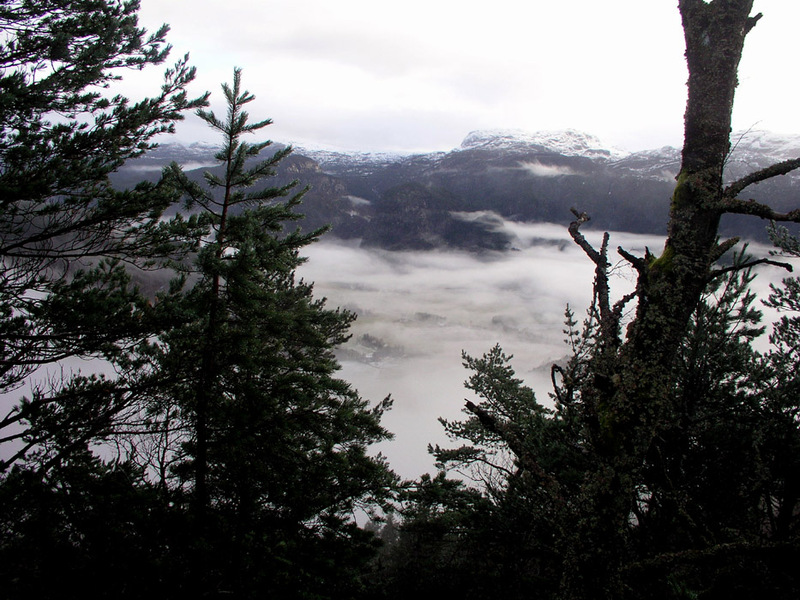 Higher up, the trail leaves the creek and heads more to the right as it climbs towards the Vinjanuten summit. The terrain is pretty rugged, quite a bit of snow is needed before this sort of mountain is really skiable. Continue upwards between boulders and small cliffs until you locate the very impressive summit cairn. 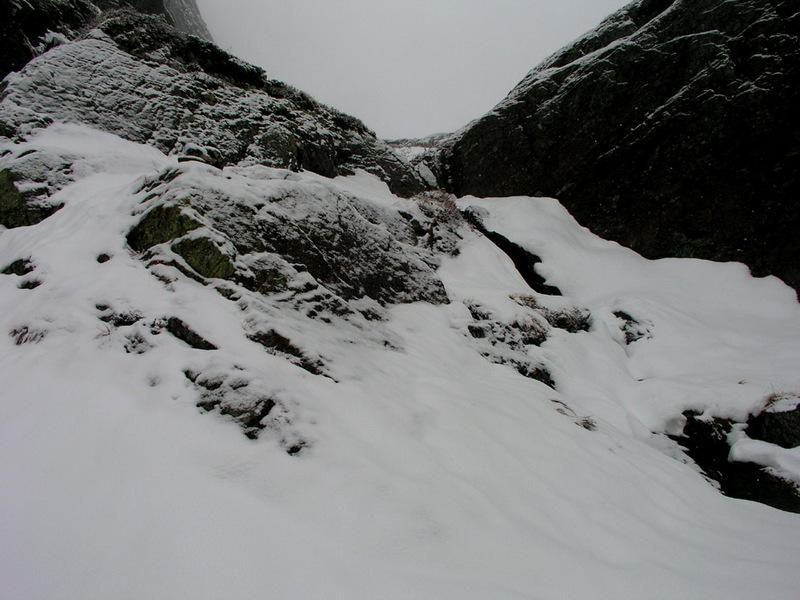 Alternative route: I was told by a local person that there is an alternative, steeper route to the summit. This route heads right up the large, distinct gully that cuts the mountain cliffs that face the small community below. It is probabely best as a summer route. In winter, this route may be icy and less attractive. Comments: I started early from Bergen, because of the long drive and the short days this late in November. However, the first ferry from Halhjem did not leave until 0800, surprisngly late for serving E-39, the main connecting route between Bergen and Stavanger. Finally on the island of Stord, I headed south observing an unusually disruptive driver ahead of me. He came off the same ferry, made an unsafe overtaking directly from the ferry, then started an erratic type of driving hitting the accelerator and brake in rapid succession. Slightly annoying, but the day looked too good to be disturbed. Blue sky further south and west, could this turn into a really perfect day? I continued to the ferry at Ropeid, made a perfect connection and headed to the trailhead. Started hiking at 1130, arriving at Prestastølen after about one hour. 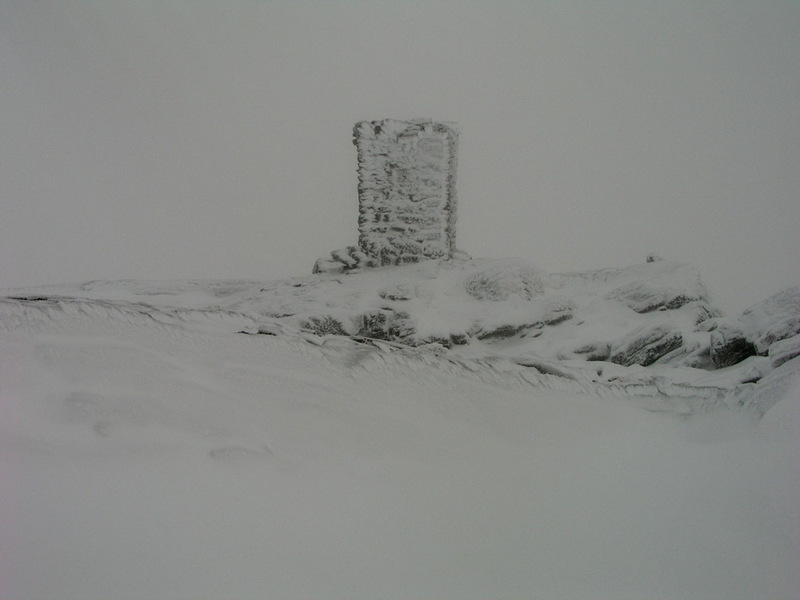 I continued to the upper farm cabin and made the summit in dense fog, and flurries of snow, shortly before 1400, about 2.5 hours. There were many ptarmigans, I came upon at least four different groups on this relatively short hike. I carried my skis until elevation 850 meter, then decided that the terrain with numerous cliffs and only narrow ledges, was unsuitable for skiing. I left the skis and continued on foot to the summit. Lunch and a short rest at the summit, close to zero visibility. Too bad, this is the most prominent peak in Rogaland (ie. the one having the largest primary factor.) The views from up here on a clear day, must be quite spectacular. Returning, I followed my own tracks in the fog and quickly descended. I was back at the car at 1530, slightly less than 1.5 hours. The rocks and roots from trees were ubelievably slippery, a thin layer of ice would not have been significantly different. I drove home via Røldal and Odda, then to Løfallstrand and ferry. I had a good ferry connection, and a total travel time of about 4 hours. The mountain,as seen from the traihead. 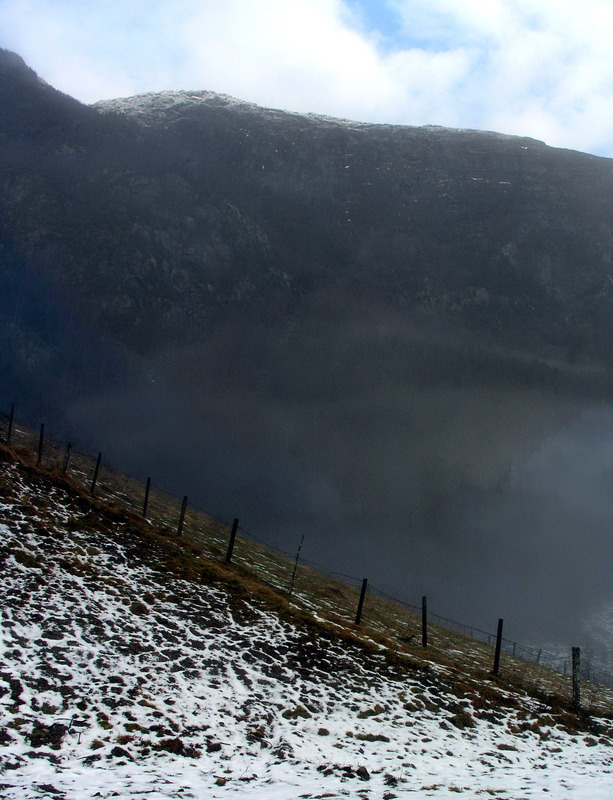 The alternative route runs up the huge gully coming down (sloping right) in the middle. Valley view, the weather started out nicely. I am above the fog with quite a good view. 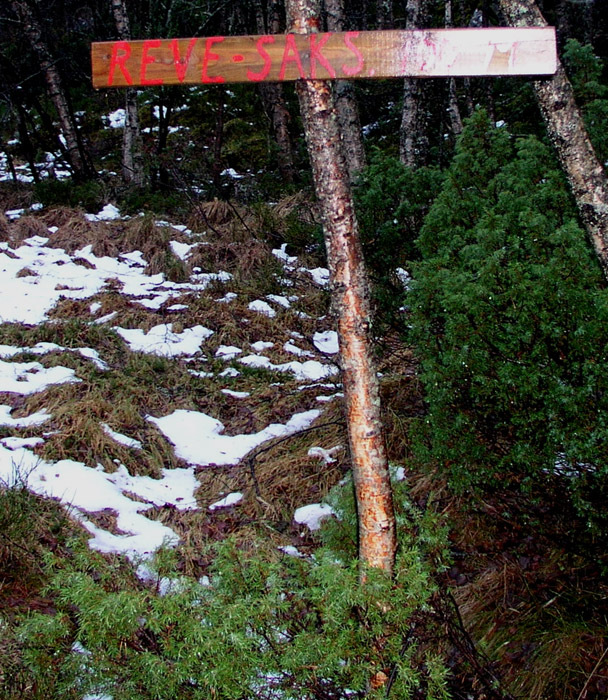 A sign warning hikers about a fox trap. I guess the assumption is that the fox is less proficient in reading. 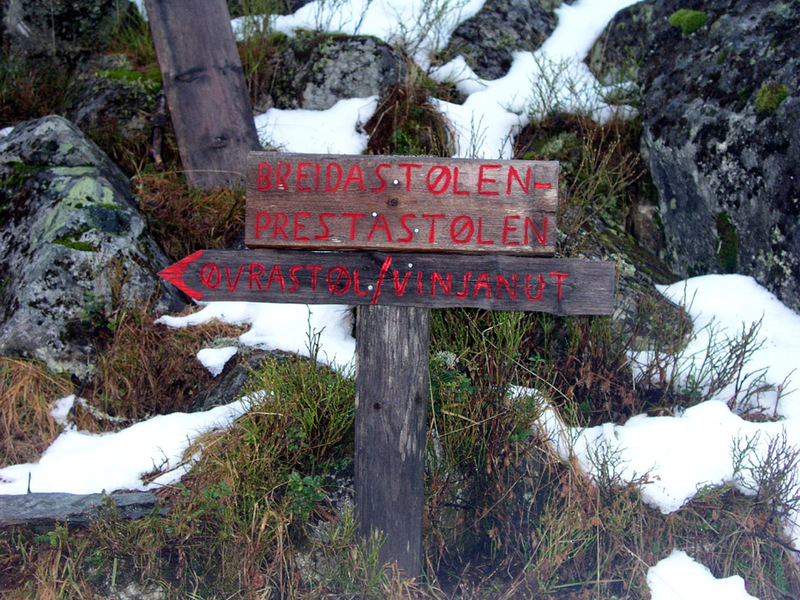 Trail sign, the map says Breidastølen, all other signs except this one call the place Prestastølen. The upper cabin, the route heads up along the creek on the right hand side. Trail detail, it is steeper than it looks. Not a skiers dream. I carried my skis 800 vertical meter just to conclude that this was not (yet?) a skiers mountain. The summit cairn, quite impressive.